Grapes are brilliant. Rich in nutrients, good for the skin, possessing sugars, antioxidants and minerals but they´ve also got anti-wrinkle properties, not forgetting the most important - wine. Not that, for a minute, I think I´ll be wrinkle-free. My destiny is more of them, though I guess they could be slowed down. The active polyphenols help slow down the elasticity of the skin and the pips are great as an exfoliant that may even (if possible) help renew cells. So do we just smear grapes on our face? No, not exactly. The best way is to crush some grape seeds in a mortar and pestle then add some (the experts say) almond oil, I add what is available which is extra virgen olive oil. 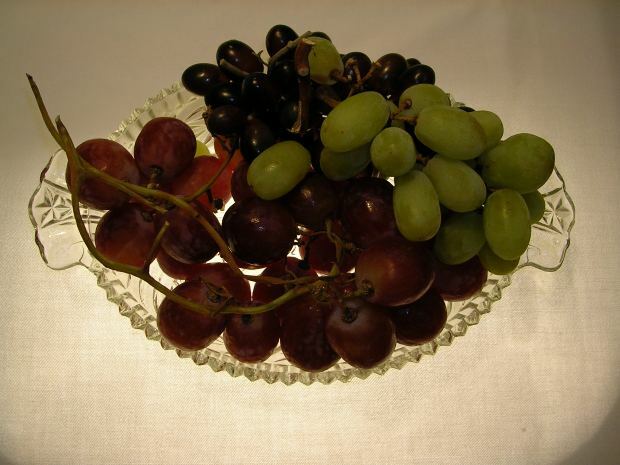 Grapes are also good rehydraters as well as colagen producers and an antioxidant. Take two grapes mash and mix well with two vitamin E capsules, smear on your face, leave it overnight (or as long as you can bear) and wash off. Notice the more toned, smooth and tight difference!